That bundle of joy in a pregnant belly sure makes it hard for a mama to sleep comfortably. Pregnant women, just like other folks with back pain, need support when lying down. And the easiest answer to this problem is a contoured body pillow. The best pregnancy pillows cradle a body to relieve pressure on the spine. But it’s not only pregnant women who love using them. People with herniated disks, sciatica, fibromyalgia, and other health conditions find the relief they need to rest when they use contoured pillows. Let’s take a closer look at the top maternity pillows to see which one will be the best for you. 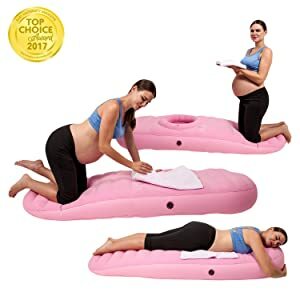 When you first see the Cozy Bump Pregnancy Pillow, you may notice its similarity to an air mattress. In fact, it’s a lot like an air bed, not just a pillow. But its design isn’t flat, it’s curved, because it’s specially made to relieve pressure on the back. The Cozy Bump is inflatable, so it’s easy to store and transport in its carrying bag when it’s not needed. You can fill it with any air pump that’s compatible with a camping mattress. It only takes a couple of minutes to get it ready. Once it’s inflated, the soft surface beckons you with its flocked texture. The feel of it is similar to what you’ll find on an air mattress. The pillow’s design is sloped, with one end thicker than the other. It has a bump in the center, and the bump surrounds an opening made to accommodate a pregnant tummy. That way a pregnant woman can lay down with her stomach inside the pillow. There’s no pressure on her baby, and she’ll instantly feel relief for her back. Other users with low back pain have also enjoyed the Cozy Bump. The shape allows them to lay face down, something many of them haven’t been able to do for a long time. The company quotes a chiropractor who recommends the pillow to his patients because the bump and decline takes pressure off the back, which is very comfortable for those with herniated disks. For users who aren’t pregnant, it isn’t necessary to inflate the ring around the opening. It has a separate air valve and can be left alone. There are just a few points to note regarding the Cozy Bump. One, it needs to be inflated all the way to provide the right amount of support. Two, you will need an air pump to fill it since filling it by mouth isn’t possible. And three, the maximum recommended weight it can support is 300 pounds. The Leachco Snoogle Total Body Pillow was invented by a mom who’s also a registered nurse. She had first-hand experience with the discomfort that pregnant women face when they try to lay down and sleep. Now, instead of piling up a variety of regular pillows, women can enjoy the comfort that comes from just one C-shaped Snoogle. 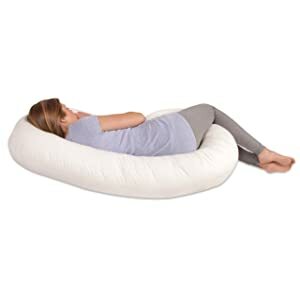 The Snoogle balances the need for support against the extra body heat that many pregnant women suffer. Its curved design cradles the whole body, from head to knees. You can use it curled around your back or cradled between your arms, whichever way is most comfortable. But the curved shape is made to let your body breathe so you don’t overheat while using it. Another thoughtful feature is the removable cover. This sham-style pillowcase is machine-washable. The Leachco company sells replacement covers should you want to have more than one on hand. But don’t be fooled by the fact that pregnant women love this pillow. Its design is perfect for anyone who is suffering back or hip pain for any reason. And so is the next one below. Also by Leachco, the same company who makes the Total Body Pillow, is the Back N’ Belly Contoured Body Pillow. These two products differ a bit in shape. While the Total Body Pillow is made in the form of a letter C, the Back N’ Belly looks like the outline of an hourglass. This form hugs both your back and belly at the same time, putting your hips into a neutral position. The purpose is to relieve not just back pain, but also support your body during pregnancy, or if you suffer from reflux, fibromyalgia, carpal tunnel, or even a cold. The double-curved shape lets you simply roll from one side to another without having to rearrange the pillow around your body. Leachco sells replacement pillow cases for this pillow. Each case, or sham cover, is machine-washable. 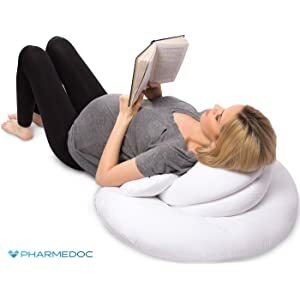 If you like the C-shape of the Leachco Total Body Pillow, but want something a little more substantial, you may prefer the PharMeDoc Full Body Pregnancy Pillow. Not only is it a back support pillow, it can also serve as a nursing cushion for new parents. 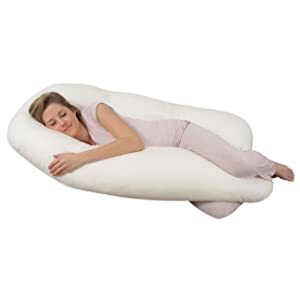 The best feature of the Pregnancy Pillow is that it’s very versatile. You can curve it around the front or back of your body, plus you can mold it into a spiral shape that supports your back while you sit up in bed. The pillow comes with a zippered machine-washable pillow cover. PharMeDoc also sells replacement covers. They offer a lifetime warranty on their product, along with a 100% satisfaction guarantee. When you’re suffering with back pain or an achy body, the right body pillow can make all the difference for a good night’s sleep. We hope we helped you discover the perfect maternity pillow today. Check back soon for new reviews of the best products for comfort and fun at home and on the road.